TRAVEL GUIDE: Girls' Trip to Charlotte - Where to Eat, Stay and Play! 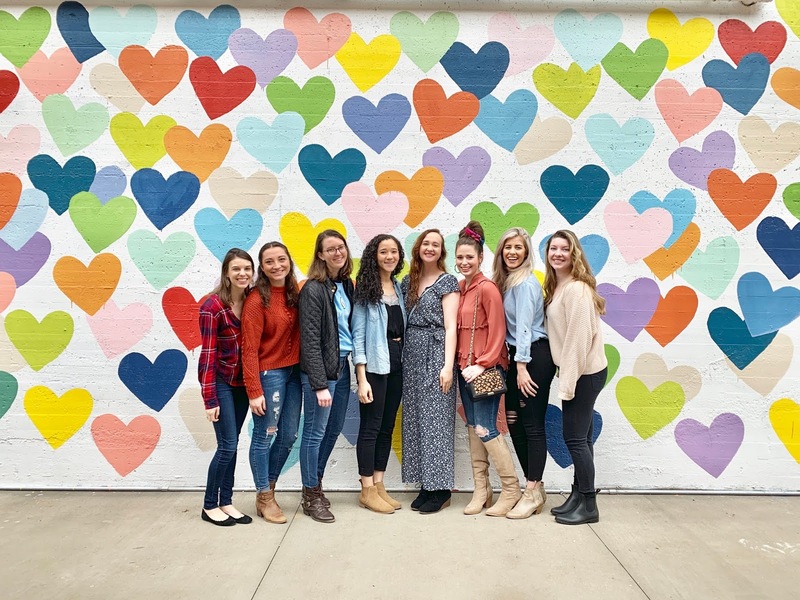 Charlotte, NC is the perfect Southern destination for a girls' trip - allow me to convince you of that in today's blog post with this Travel Guide! 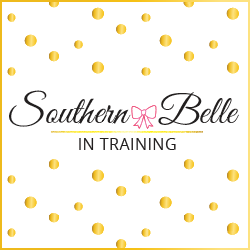 Today I'm kicking off my Tuesday blog post series for April... it's all about CHARLOTTE! Backstory for anyone new here: I lived in Charlotte for four amazing years (three years in undergrad, and one year post-college!). Truth be told, there's a high chance that I never would've left, or at least would've stayed there for quite a bit longer if I had been able to find a full-time job there. Unfortunately for me, Charlotte is an extremely competitive market for radio/TV jobs, so the best that I could find with minimal experience was a part time job, hence why I moved to Vermont. Anyways, I am so thankful for the years that I got to live in Charlotte, and since moving to Virginia last year I've been so happy to be in driving distance again! In this month's Tuesday blog post series, I'll finally be sharing complete Charlotte Travel Guides on my favorite restaurants, hotels, and things to do from my time living there, and visits back since. Breakfast stop at Nova's Bakery before our Saturday began! L to R: Me, Emily, Abigail, Shannon, Kelly, Lily, Eden and Darian. WHY CHARLOTTE: First and foremost, because I was obsessed with it when I lived there, and miss it dearly now! I'm always down for a chance to go back. But why Charlotte for a girls' trip? It has a great location in the Southeast! It's at the crossroads of two major interstates, and also has Amtrak service as well as a large international airport. The weather is also generally great in Charlotte- and they have a less harsh winter than we do in Virginia. It's filled with fun things to do, most of which are perfect for a girls' weekend. And finally- because Charlotte isn't traditionally seen as a "tourism city" (it's more residential and most people that travel to Charlotte are there for business), it's easy to find great deals on food and lodging because it isn't a place with exorbitant prices on things geared for tourists! If you're a fellow Southern gal, I can't recommend Charlotte enough as the perfect destination for a trip with your favorite ladies. I had to take all the girls to visit my alma mater- Queens University of Charlotte! Hilton Executive Park: This is where my friends and I stayed on this trip, and I can't recommend it enough. I booked two rooms for all of us... and the rate for Friday-Sunday was just under $90 a night!! That's unreal! This hotel is an easy 10-15 minute drive from Uptown Charlotte, South End, and SouthPark, which are three neighborhoods that you'd probably want to spend time in for girls' trip activities. My friends and I were impressed with how large and comfortable the rooms were for the rate we paid, and the lobby was very swanky as well! There are a number of Hiltons in Charlotte- I think that this particular one offers such great rates because it's a little outside Uptown. The Ballantyne: I've never personally stayed here, but I used to live near this hotel during my last year in Charlotte. Boy is it incredible! It is a luxury hotel with multiple restaurants, a spa, and golf on-sight. It's also a very popular wedding venue. This hotel is located in Ballantyne (very south Charlotte), which is its own nice area. It is further from Uptown- if if your itinerary has a lot of activities in that area, I wouldn't suggest this one. But if you're looking for a very mellow and relaxing girls trip filled with spa and pool days- this is the hotel for you! Le Meridien Charlotte: This is my favorite hotel in Charlotte! I did a staycation there back in 2016, and I still love it today. Conveniently my favorite rooftop bar, City Lights, is on top of the hotel! This hotel is on the outskirts of Uptown so it offers incredible views of the city, but is still close enough that everything in Uptown is walking distance. Uptown hotel prices can jump on some weekends- but you can find good deals at this hotel! EAT: Charlotte has THE BEST restaurants!! I'll be doing a food-specific Charlotte Travel Guide this month on a future Tuesday which will include my recommendations from all over the city, but for today I'll focus on restaurants or cafes best suited for this type of trip! Amelie's (multiple locations in Charlotte): If you only make it to one restaurant I suggest- let this one be it because this is as quintessentially Charlotte as it gets food-wise! Amelie's is a local chain of French bakeries. The original, in the NoDa neighborhood, is open 24/7- even on holidays! Now Amelie's has expanded across Charlotte and also has locations in Uptown, South Charlotte, and even beyond in South Carolina and Georgia! I am being 100% honest when I tell you I've never ordered something I didn't like. I love their sandwiches, hot and cold beverages, and of course all of the incredible French pastries! Visiting one of their locations is a must- both for the amazing treats and the cool decor! Nova's Bakery (multiple locations, I like the South Blvd. location): Charlotte has a plethora of coffee shops to choose from. In addition to a few Starbucks in every neighborhood, there are lots of local coffee shops and cafes to visit as well. While you can't really go wrong with any of them, my personal favorite is Nova's Bakery. The South Boulevard location is pretty no frills and small, but it has a welcoming feel. Nova's serves the best chai latte I've ever had - not exaggerating! I love chai lattes and I've never found one that comes close to Nova's. Their pastries and breads are also delicious- I'm a big fan of their scones for breakfast. Vapiano (201 S. Tryon St. #201, Charlotte NC, 28202): I was so sad I wasn't able to take my friends here, but I typically eat here when I'm in Charlotte, and it's a great place to bring groups to! Vapiano is an amazing Italian restaurant in Uptown. It's actually a European chain with a few US locations (I've also been to the NYC one!). It's incredibly affordable- most full meals are under $10. They make their pasta from scratch in house and it's absolutely delicious, as-is everything on the menu! Vapiano also has a fun modern feel to it with the cool decor. Cantina 1511 (4271 Park Road, Charlotte NC, 28209): My friends and I ate dinner here on our first night after arriving in Charlottesville! I feel like any girls' weekend calls for tacos and chips and salsa, right? This restaurant is conveniently located in Park Road Shopping Center in Charlotte, and has such a fun atmosphere inside, plus great food! Kid Cashew (1608 East Blvd, Charlotte NC, 28203): Such a unique and delicious restaurant that I love going to when I'm back in Charlotte! It's a farm to table restaurant, that also has a lot of small plates on the menu. Their mac and cheese is some of the best that I've ever had in a restaurant! They also have a lot of healthier or vegetarian options on the menu. We had lunch here on Saturday and everyone enjoyed it! More Confetti Hearts Wall pictures! PLAY: There is SO MUCH to do in Charlotte! Activities for every personality and in every part of the city, as well as in the counties surrounding. As with the previous sections, I'm just going to try and keep it brief and highlight what we did on our trip, or other things that would be perfect for girls' weekends. Shop 'til you drop: One of the main things I miss about Charlotte is the shopping options! There are multiple malls, and tons of shopping centers and boutiques throughout the city. The crown jewel of Charlotte malls is SouthPark. It's Charlotte's most high-end mall, although there are some affordable stores as well. SouthPark ranges from Old Navy and LOFT all the way to Neiman Marcus, Tory Burch and Louis Vuitton. My personal favorite stores in SouthPark are their Ann Taylor and the Belk- it's actually Belk's flagship store!! Belk SouthPark also has a fantastic Lilly Pulitzer department. In addition to SouthPark, there are two outlet centers in the city, Charlotte Premium Outlets and Concord Mills (I prefer Concord Mills between the two). In full honesty I was never big into Charlotte's boutique scene, but a few fun ones to check out include KK Bloom, Petal, and Julie's! Billy Graham Library: An incredible museum that's also free to visit! (I wanted to do this with my friends on Saturday- but like typical girls we picked the mall instead. #oops) I visited the Billy Graham Library once a few years ago when my mom was in town, and I loved it. It's a wonderful interactive museum dedicated to the life and ministry of Billy Graham and family. He was truly an incredible man and a warrior for the Christian faith! Mural tour: Charlotte is filled with fun murals, and you could spend a whole afternoon finding some of the best ones! My friends and I visited the Confetti Hearts wall, which is a newer mural but it is already Instagram Famous. Since it's been a couple years since I've lived there, I'm not as up to date on all the new ones, but this mural guide from Charlotte Agenda is quite comprehensive! Brewery hopping: Charlotte is a brewery city, and a perfect place to spend the day on a beer crawl with friends. I feel like the brewery craze really got going while I lived there in college... I feel like the amount of breweries had tripled by the time I graduated! Confession: I've only ever been to one Charlotte brewery (I'm more of a winery girl). I went to Sycamore in South End a few years ago, and it was fun! Other popular ones that I know people frequent are Wooden Robot, Lenny Boy, Birdsong and Heist. Dancing the night away: This might be my favorite Charlotte activity of all- even more than shopping! 😉There's just nothing like Charlotte nightlife. SO many fun bars and nightclubs to go dancing at! 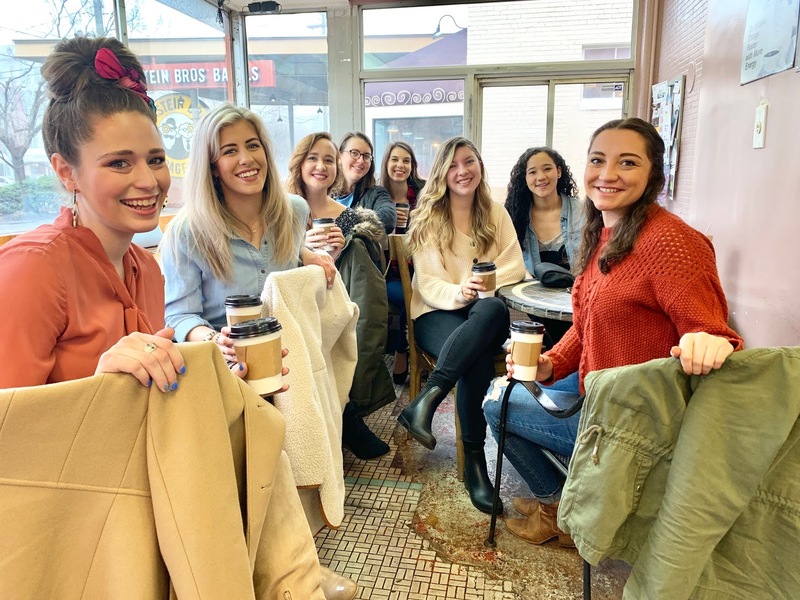 While I never would recommend heading Uptown late at night by yourself, a girls' trip is the perfect excuse to hit the town (plus safety in numbers!). There are a lot of great nightlife spots in Charlotte- but I think the best place for large groups of girls are the bars/clubs in the Epicentre which is a huge entertainment complex in the heart of Uptown. My friends and I went to Whiskey River there, which is always a fun bar to dance at (and they play a great mix of music every time!). We spent our whole night at Whiskey River since we were having fun, but Suite, Kandy Bar, and Howl and the Moon are also fun options right in the Epicentre. There's also a really nice movie theatre and a bowling alley in there too if nightclubs/dancing isn't your thing! All of us before going Uptown on Saturday night, also with my Charlotte friends Caroline and Priyanka! 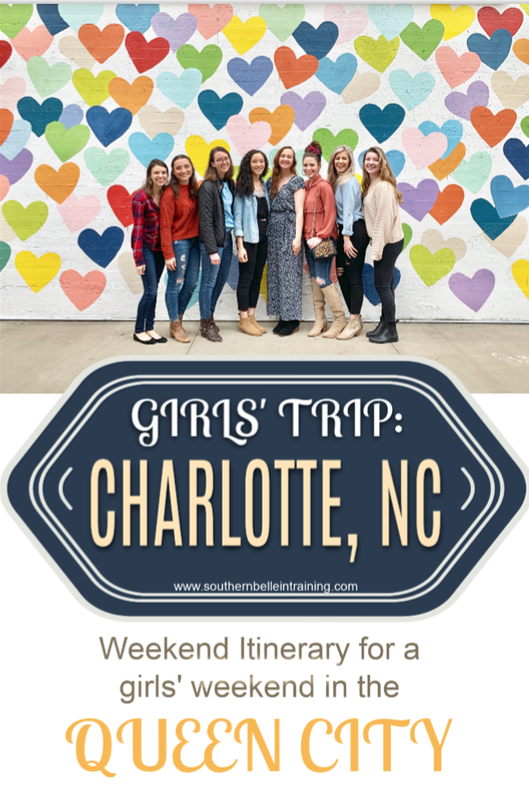 Have you ever done a girls' weekend in Charlotte before? Also- let me know if you have any Charlotte specific travel questions for future Tuesday posts this month! Girl I love your outfit for your girls day- and your bun! It fits you so well! As a Maine girl I AM wondering if I would love the Carolinas, what do you think, should I visit? I love that it has the mountains and the coast as well! My brother lives in NC for quite awhile and loved it! It looked like you had so much fun in Charlotte! Thank you for sharing lovey!! its been so long since ive been there but it looks like SUCH a blast that it makes me want to hop on a plane right now ha- love this guide girl- so many fun things to do see and of course EAT with your best gal pals! Charlotte is such an awesome town. My favorite aunt used to live and we loved to visit her and her family. I really like that it is such a classy and beautiful city. Thanks for the shopping and dining tips. This looks like such a fun girls trip. I love the heart mural! SO cute. Charlotte is one of my favorite cities! My in laws live right outside the city, so we love exploring when we visit them. I love Amelie's! We've also done the Charlotte Brewscruise to visit a few of the local breweries. I loved it even though I'm not huge into beer. We are visiting next month so I'm excited to try something new! I'd love to visit the heart mural! It's so cute! I've only ever had layovers in Charlotte. would ove to explore the city a bit! Oh my goodness! This looks like such an incredible girls trip to Charlotte. That city has been on my list of places to visit, and now I want to explore it even more! Thanks for sharing your adventure with us! Oh my goodness Charlotte sounds amazing! I would love to visit. We've actually had a layover there and we want to visit sometime. That wall is soo fabulous. I would love to see it. Also, the shopping sounds sooo good. Too fun.